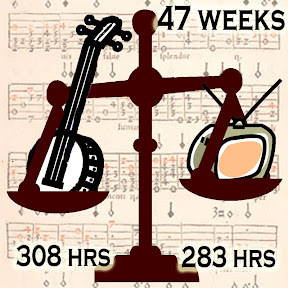 A weekly check-in on the Banjo versus TV project — J.R.'s resolution to spend more time in 2008 on his banjo than on TV. 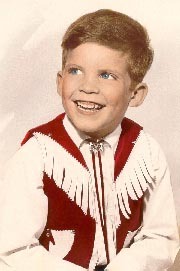 This post covers 11/18/2008 through 11/24/2008. We discussed the bringing of books to a jam session. I'd loaned someone a copy of The Parking Lot Pickers Songbook at the Costello's jam and he'd given the book to Dave to return to me, which is what kicked off the discussion. Dave figures that the only good role for books at a jam is to provide lyrics. I noted that, at this stage in my playing, I'm using the books to know what chords to play. Dave suggested that I instead learn to watch the guitar player for chord prompts. I've been working on this, of course. It was the whole reason I took guitar lessons this fall. But I'm not there yet. ...for exactly the reason Dave mentioned: so you can learn to follow the guitarist's chords. Dave played me a 1975 Steve Goodman version of Mama Don't 'Low and a Doc Watson recording of the same song. Dave's been helping me prep for the songs we'd like to play at the family jug band get-together in December, which includes Mama Don't 'Low. When I first started my lessons with Dave he told me we'd be spending a lot more time listening to and playing along with recorded music and a lot less time working with tabs. We discussed bluegrass harmonies and the bass, baritone and tenor parts. Dave told me a trick that he sometimes uses when he plays guitar with another guitarist. If they're playing in A, he'll let the other guitarist play without a capo and he'll play with a capo. That means that, while both guitars as playing in the same key, they're both playing a little differently. This sounds like a good idea and is applicable to other capo-capable instruments (like the banjo). ...and you continue to play in A. My homework includes switching between C and F chords. Spent a chunk of time working on tabs for the upcoming family jug band: Underdog and Duelin' Banjos. For various reasons I spent a lot of time waiting in my car this week. Happily I'd brought along the sawed-off banjo so I got some good practice time in as I waited.